Eden Fish Cuisine is a naturally hypo-allergenic, nutritionally complete food formulated with a high content of quality animal protein and low carbohydrate content, based on the Ancestral diet of dogs. Medium sized kibble suitable for all life stages. 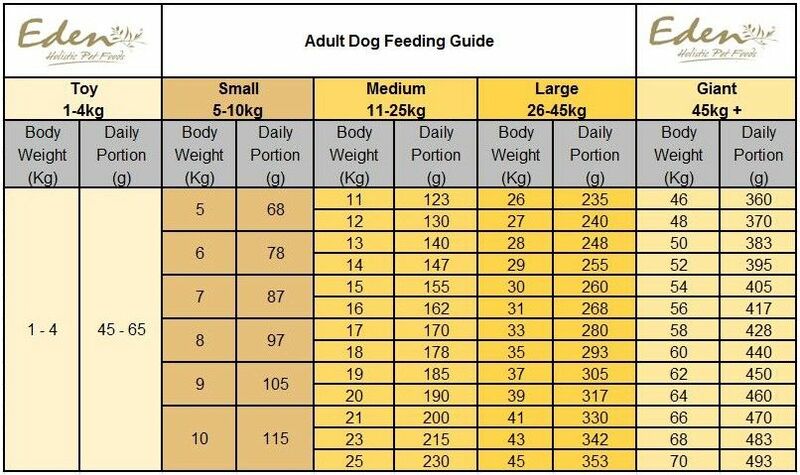 What is Eden holistic dry dog food? Eden Fish Cuisine has been made in Britain with freshly prepared, human grade quality Scottish Salmon, North Atlantic Herring, and seasonally available Cod, Haddock, Hake, Plaice, and Pollock dependant on the “Catch of the Day”. What are the benefits of feeding Eden holistic dry food? 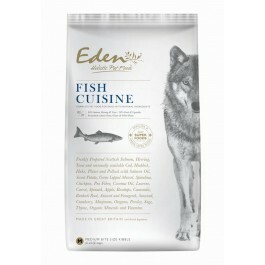 What is in Eden Fish Cuisine dry food? Composition: Freshly Prepared Salmon 23%, Dried Herring 21.5%, Sweet Potato 13%, Dried Fish (including seasonally available Cod, Haddock, Hake, Plaice and Pollock) 8%, Dried Salmon 8%, Freshly Prepared Trout 6%, White fish 6%, Salmon Oil 6%, Pea Fibre, Salmon Stock 1.5%, Lucerne, Chickpea, Coconut Oil 0.5%, Spinach, Carrot, Apple, Green Lipped Mussel 0.1%, Spirulina 0.1%, Rosehips, Burdock Root, Camomile, Aniseed & Fenugreek, Seaweed, Marjoram, Oregano, Parsley, Sage, Thyme, Vitamins & Minerals, Fructooligosaccharides 960mg/kg, Glucosamine 340mg/kg, MSM 340mg/kg, Chondroitin Sulphate 240mg/kg, Mannanoligosaccharides 240mg/kg. Analytical Constituents: Crude Protein: 39%, Crude Oils and Fats: 17%, Crude Fibres: 3%, Crude Ash: 11.5%, Moisture: 8%, Omega 6: 2%, Omega 3: 3.1%, Calcium: 2.1%, Phosphorus: 1.5%. Nutritional Additives: Vitamin A (retinyl acetate) 14,400 IU , Vitamin D3 (cholecalciferol) 2,165 IU , Vitamin E (alpha tocopherol acetate) 95 mg. Enriched with essential vitamins and oils. Naturally stabilised with mixed-tocopherols. Contains no added synthetic antioxidants. Trace Elements: Ferrous Chelate of Amino Acids Hydrate 320 mg, Zinc Chelate of Amino Acids Hydrate 320 mg, Manganous Chelate of Amino Acids Hydrate 225 mg, Cupric Chelate of Amino Acids Hydrate 145 mg, Calcium Iodate Anhydrous 1.58 mg, Organic Selenium S.cerevisiae CNCM 1-3060 125 mg, Amino Acids: L-Carnitine 960 mg.
Eden Original Cuisine is a naturally hypo-allergenic, nutritionally complete food formulated with a high content of quality animal protein and low carbohydrate content, based on the Ancestral diet of dogs. Medium sized kibble suitable for all life stages. Eden Country Cuisine is a naturally hypo-allergenic, nutritionally complete food formulated with a high content of quality animal protein and low carbohydrate content, based on the Ancestral diet of dogs. Medium sized kibble suitable for all life stages. Eden Semi-Moist Duck & Tripe is a naturally hypo-allergenic, nutritionally complete food formulated with a high content of quality animal protein and low carbohydrate content, based on the Ancestral diet of dogs. 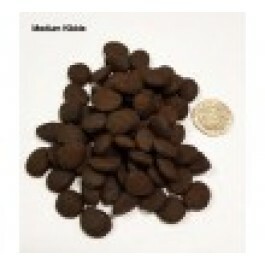 Medium sized kibble suitable for adult dogs.